FatCow Review : Best WordPress Hosting in USA that provides a full spectrum of hosting services from shared hosting to dedicated servers with the unique branding. Fatcow is around for quite a while now. They started their services in 1998. FatCow has made their name with the focus on beginners and DIY website owners. FatCow is a shared web hosting company that provides email, a website builder and various complementary services to web hosting 24×7 support and 30 days money back guarantee. In this article, I am going to give you an honest review of the FatCow. Let us first have a look at the Pros of the FatCow. The primary advantage of FatCow is the short term pricing and the plan structure. If you choose their yearly plan, you are likely to get a heavily discounted rate for the first year. FatCow web hosting has a single web hosting plan with unlimited everything. Web hosting companies are all selling the same thing- a place where you can keep your website. But they all have different pricing and plan structures. FatCow makes things simple because they only have on a shared hosting plan which usually starts at a discounted price of $49/year. But the plan renews at $155 per year after that. The plan includes unlimited domains, disk space, and the databases. Plus you get plenty of bonus features like unlimited emails, ad credits, and a free domain name. If you are running out of the budget, you can get a hosting plan for as low as $50/yr. As a website owner, there are some things that you have to take care of. Website backups is one such thing. Website providers will take care of the backups manually or through other services. But it is always safe to have a backup that is done by the hosting provider. Most of the backup companies provide occasional backup and charge for the services. FatCow provides free daily backups which are a bonus feature to include. Fatcow provides a few other interesting features that are good to have. They also provide random bonuses like free website design icons and a fun, friendly tone. The FatCow provides a simple backend for managing the website. You usually get an access to the account dashboard to manage your plans, products, and any other add-ons. You can also get an access to the actual server backend where you can install the software and get the server information for whatever you need. Usually, your server’s backend will offer a range of auto installers that will install common software like WordPress for you. Each of the web hosting provider company approaches these three areas differently and the backends of the various hosting providers can vary a lot. FatCow is a custom backend. They do not use the industry standard cPanel. This can be seen as a disadvantage. However, if you are a beginner or have basic needs from hosting backend, then FatCow is pretty simple and straightforward. FatCow backend is not the prettiest background but it is not confusing or different than most of the hosting providers on cPanel. If you are having an existing website hosted somewhere else, FatCow will help you to transfer it free of charge. They will also provide a free domain name for the new account setups. FatCow has a 30-day money back guarantee on all the hosting plans. However, please note that they can only refund if the payment has been made through the credit card. Do you need some web icons to boost the overall design of your website? Fatcow provides you 3926 professionally designed web icons. All the icons are completely free. But there is a condition to using the icon. For example, if you use the web icons on your site, you’ll have to make sure that you link the credits to their website. Fatcow has a great short-term pricing structure. But when it comes to the long-term pricing, FatCow is a bit expensive. First, FatCow renews at $155 per year if you renew it for a year. However, the pricing is more expensive than direct competitors. Hostgator renews for as little as $6.95 per month when you sign up for three years and $8.95 when you renew for a year. FatCow is more expensive if you are looking for a long-term hosting plan. Upsells are not necessarily a bad thing. They provide cheaper overall prices for most while providing the specific services for anyone who wants to pay for them. Upsells can be a bad thing when they are over aggressive or when they are added without explicit consent. They can be bad when they are added without the consent. 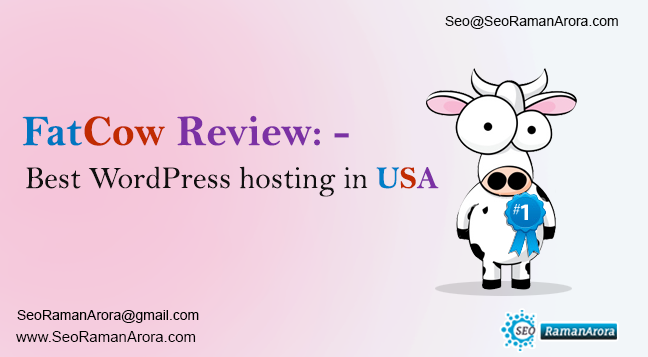 FatCow Review : Best WordPress Hosting in USA overall. If you are looking for a good hosting provider for short term, FatCow is the best choice for you. If you are low at the budget, you can choose FatCow for the web hosting.